Jerry and Lillian Smith receive a gift of a goat from Kitete parishioners. 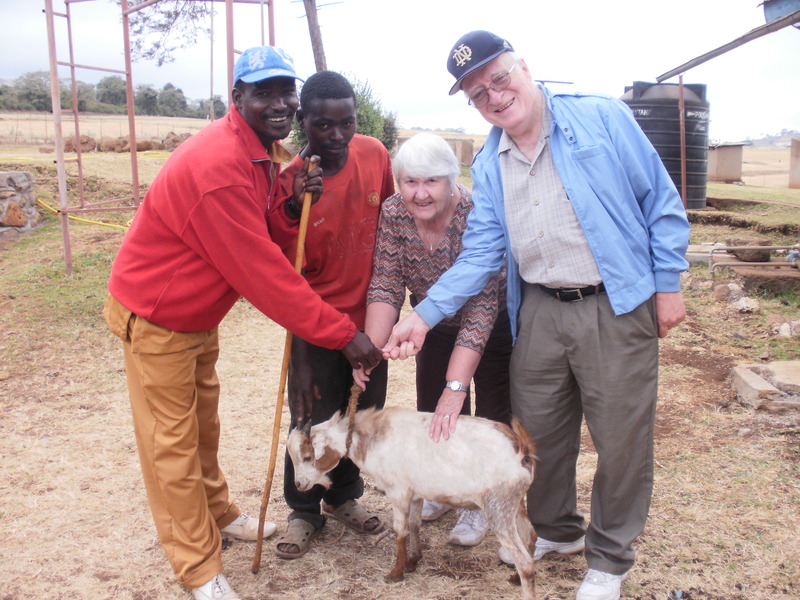 GRANGER — For Jerry and Lillian Smith of Granger, a recent September visit to see Jerry’s brother, Holy Cross Father Tom Smith, in East Africa, is something they will not soon forget. 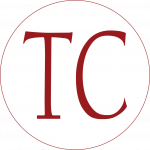 Father Smith is a missionary priest living in Kitete, Tanzania. 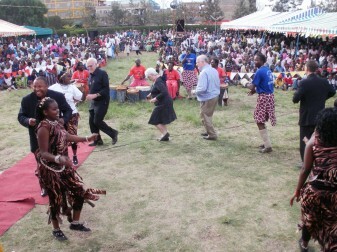 The Smiths, parishioners of Sacred Heart Crypt Parish, Notre Dame, also visited Uganda and Kenya. Despite the problems, however, the Smiths observed that those in poverty seem to be very happy people. Smith said the prominent religion among the Christians is Catholicism. Smith said most homes of the impoverished are with thatch or tin roofs with walls made of manure and sticks — the better ones — with mud and sticks. Some of the homes also have an outer coating of cement. Holy Cross Fathers Andrew Massawe, the Dandora pastor, David Burrell and Pat Neary, along with Lillian and Jerry Smith, dance in a circle at the feast day celebration for Dandora Parish. Some of those living in various degrees of poverty, according to Smith, have shops along the roads, usually quite a few next to each other, most of which are without lighting, appear to be quite dilapidated, dark and unclean, without flooring of any kind and with dirt or extremely dusty clay as their base. There is nothing that he is aware of in the United States, which can even come close to comparing how bad the dirt- and clay-based roads in East Africa actually are. Smith said most of the impoverished live off of the land and their animals. Farming is another business frequently labored by those in poverty, Smith noted. Banana groves, charcoal, coffee, tea, chickpea, corn, wheat and various other grains are raised in several of the countries wherever conditions are favorable for growing. Water can be extremely scarce and is a real concern for many who are attempting to farm and grow crops during the dry seasons.